This week we were pleased to welcome members John and Rosamund Macfarlane to give a joint presentation on their travels in three very diverse archipelagos spread across the globe. Rosamund Macfarlane started their photographic journey with the birds in the second largest of the Japanese islands, Hokkaido. These included striking images of the graceful balletic cranes in snow, shown as individuals, life-bonded couples and in groups. In particular, Rosamund pictured the rare red-crowned cranes which are so culturally revered by the Japanese and of which half the world’s 2750 population are resident in Hokkaido. Their ritual courtship dance, complete with bowing, seemed to encapsulate the Japanese character and because of the bird’s fidelity they also feature as symbols of loyalty in art and textile decorations, especially on wedding kimonos. 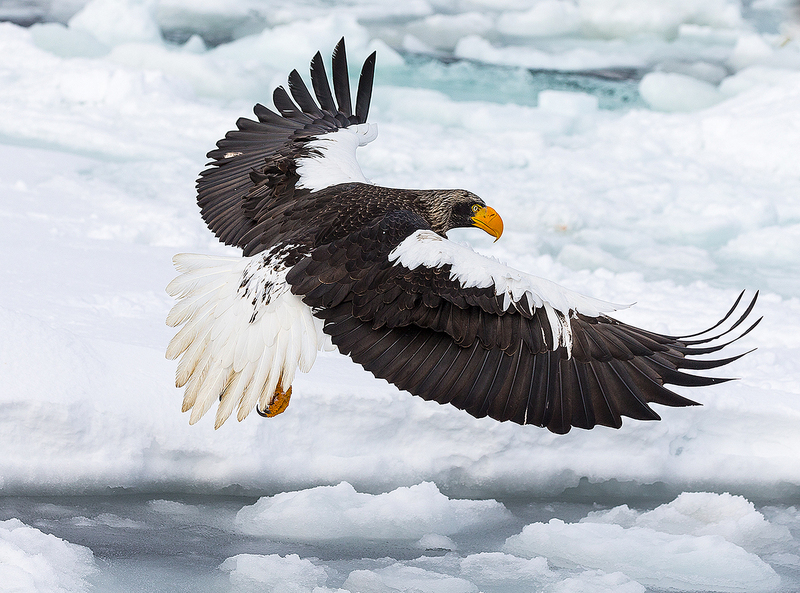 Equally special were the two species of sea eagle – white-tailed and Steller’s – of which John Macfarlane showed us many detailed and majestic examples. The Steller’s eagles have an 8-foot wing span and prey not only on fish but also on small mammals, even known to take small sika deer. The white-tailed eagle has the edge for aggression, however, and will pilfer fish from the talons of the Steller’s eagles in flight. John then took us to the island of Honshu where, north-west of Tokyo, lies the volcanic Hell Valley inhabited by the endearing Japanese Snow Monkeys. Whilst sleeping in trees in the rocks at night, these macaques come down to the hot geothermal pools to bathe during the day. Despite the tourist crowds, the Macfarlanes captured intimate and frequent poignant images of the monkeys with their young, huddling and bonding and exhibiting apparent human characteristics to charm us. The contrast with the bleak landscape and unforgiving weather of the Shetland islands could not have been more marked. We were shown graceful migratory arctic terns, guillemots, gannets and fulmars that provided food and oil for the islanders in times past. Pride of place, however, went to the ever-endearing puffins, although the sailing to their colony on Fair Isle was a gruelling one, our presenters being strapped into their boat seats as the vessel pitched and rolled alarmingly. 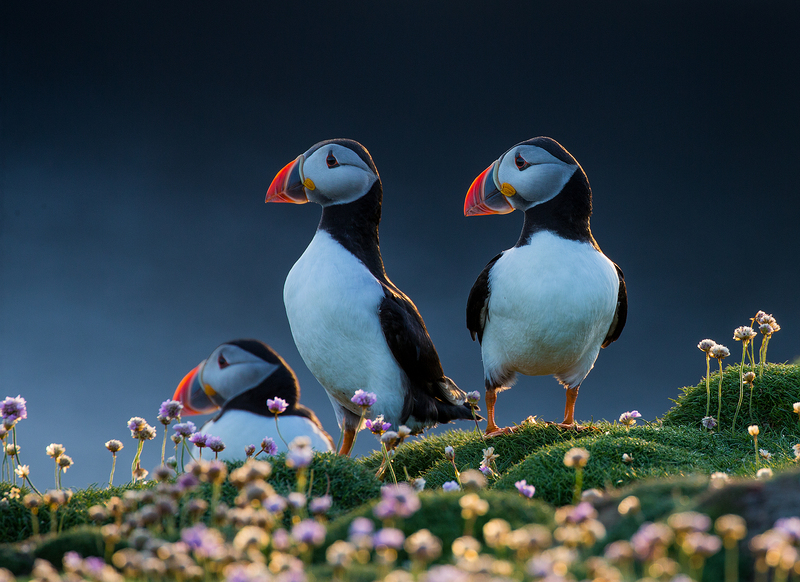 The puffins are generically referred to as a ‘circus’, so appropriate for their comical appearance and demeanour, but here again the population has halved over the past few decades as their sandeel diet declines with warming sea temperatures. Their other threat is the predatory skua (‘bonxie’ in Scotland). The portraits on show exhibited beautiful atmospheric lighting as well as capturing the character of the birds exceptionally well. Our final stop was in the Svalbard archipelago much further north, within the arctic circle midway between Norway and the North Pole. The main industry now is tourism, although John and Rosamund sailed the islands in a small 7-berth steamship rather than the cruise ships that are increasingly encroaching the seaways. The main attraction is the polar bears but the devastating effects of climate change on summer arctic sea ice is dramatically threatening their existence. John and Rosamund showed us only a few forlorn bears on the shores, mostly rather emaciated as they scavenged for birds and small mammals for survival. 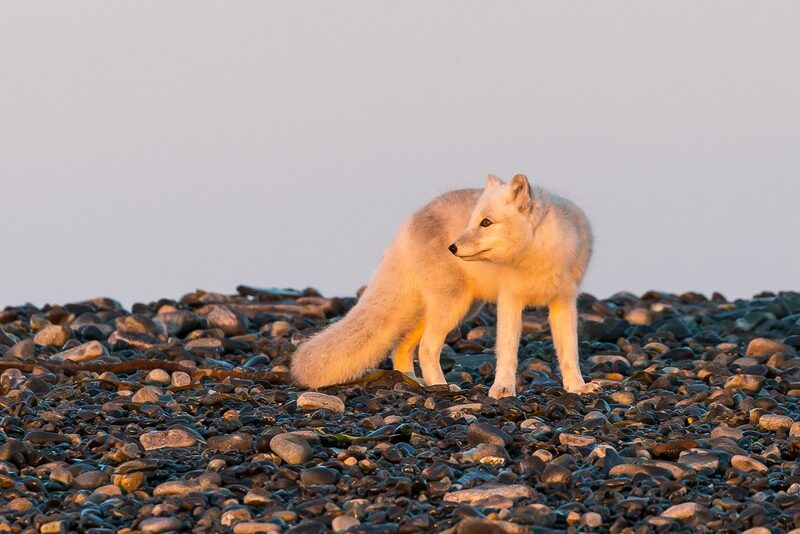 In contrast the arctic fox and reindeer were prevalent, and the fox in particular were photographed in some beautiful evening light. There were also some detailed and characterful images of walrus –generically and aptly termed a ‘huddle’. John showed us that their very characteristic tusks are actually extensions of their skulls to give them immense strength, apparently confirmed by an overly close encounter by their guide! The presentation concluded with an audio-visual sequence of the landscape features and beauty of these arctic islands. Fittingly, the climax was a moving (in all senses) series of northern lights displays. The whole presentation by both speakers was received enthusiastically by an extremely appreciative audience.